Hello English-speaking readers! I’ll showcase some of my favorite cameras in these articles, whether they are technically, esthetically or even historically worth of mentioning. First of them: the Kodak Beau Brownie. This is a (manual) translation of my original blog post in french. Most simple doublet lens optics, a large choice of two apertures around f/11 and f/16, a unique shutter speed approaching 1/50th of a second, plus timed exposure capability. These mind-blowing specs are those of the Kodak Beau Brownie series. Let’s be honest, I won’t write about technical revolution today. 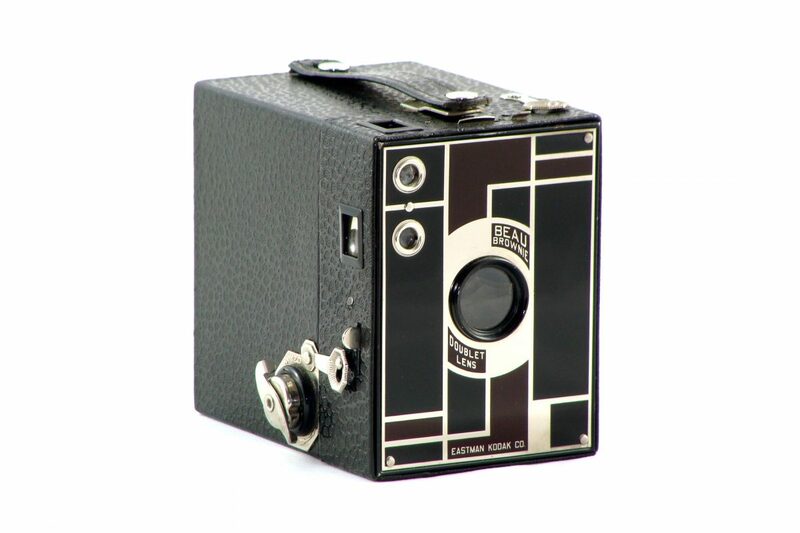 On the contrary, the Beau Brownies were as simple as any box camera when they were released in 1930. 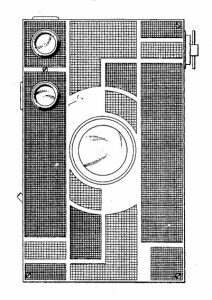 They were, however, part of a list of cameras conceived starting around 1927 by the american designer Walter D. Teague. One can have an idea of his work by browsing Teague’s patents list in this field. Walter Teague had a challenge to take up: turn a big bloated soap box into a luxurious and attractive item. And he did! He drew a most appealing Art Déco front face. Geometry and colors, lined with chrome on an enameled faceplate. The leatherette covers a wood, cardboard and metal made body, and takes a similar tone as the facade. The series consist in two models, N°2 & N°2A, corresponding to image formats 6x9cm and 6.5x11cm respectively. The two models thus differ by their size, N°2A being a bit taller. But mainly, this camera wore magnificent colors, the most frequent association being black & burgundy. Four other wonderful but more rare coats were blue turquoise, pastel pink, aqua or tanned brown. I am the happy owner of a black & burgundy model in perfect shape, near mint, as well as a blue model showing more signs of wear. Here are some pictures. Previous Previous post: Welcome to my English-speaking readers!